A combination of trial print and finished print: Paper sizes: print: 30.8 x 22.9 cm. ; trial print: 33.3 x 23.8 cm. 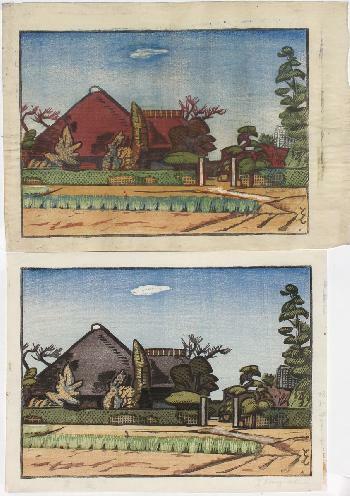 The print titled, signed and dated (Showa 4 – 1929) in pencil. Illustrated in colour in The Prints of INAGAKI Tomoo (1902-80), published by Inshokan, Tokyo 1982, p.45. Finest possible impression, colours and condition of the print – the trial print is lightly creased in places.